The emergency cart at the Dr. Otto Rodriguez San Pedro PolyClinc II now has the addition of a brand new Mobile Emergency Defibrillator. The donation came as a result of fund raisers in the form of weekly “Poker Runs” held just north of San Pedro and organized by Alexandra Nicholson of Kama Lounge. On hand to receive the donation were Mr. Owen Vellos, administrator of the Dr. Otto Rodriguez San Pedro PolyClinic II, Dr. Javier Zuniga, Dr. Noeli Nicholson and Dr. Laurenzco Nicholson . 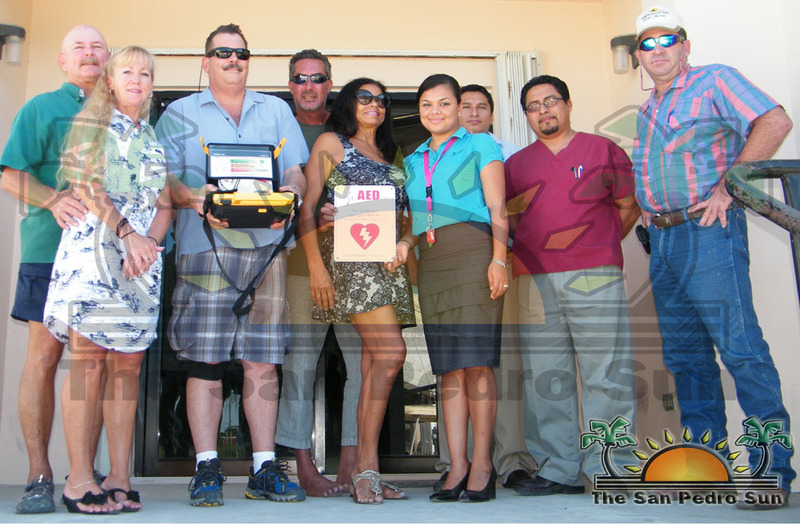 The presentation of the new defibrillator took place at the clinic on Tuesday, November 20th at 2PM and was awarded by the group of individuals instrumental in donating it. Presenting the donation were Ernie Olmstead of Captain Morgan’s Resort and Casino, Alexandra Nicholson and Dave Hauttli of Kama Lounge, Scott and Jodi from Palapa Bar and Doug from Cowboy Doug’s at Grand Caribe. The defibrillator comes with a rechargeable battery which according to Dr. Nicholson is a key aspect of the piece of equipment. Special mention must be made of Cholo’s Rentals who provided golf carts at a discounted rate for participants during the Poker Runs. The staff at the PolyClinic is eternally grateful for the donation and assures all that contributed that the defibrillator will certainly be put of use in the emergency health care system.